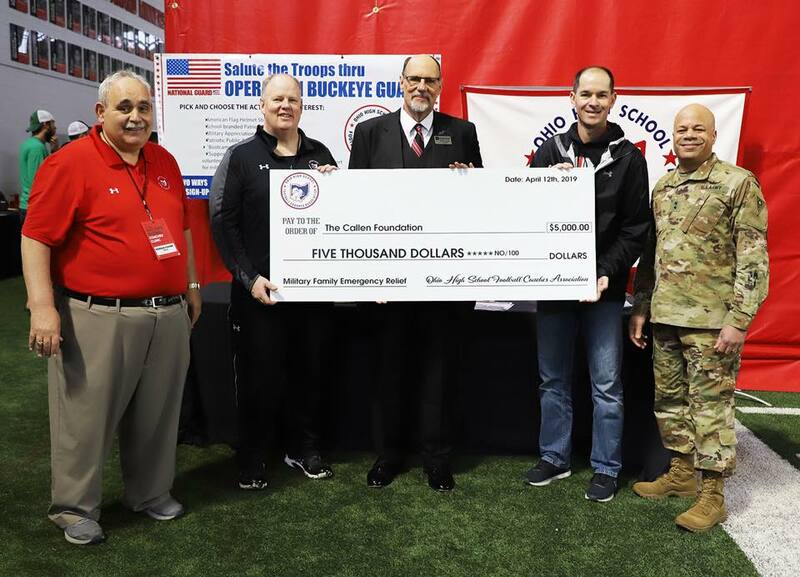 Chris Callen, Founder, was on hand to accept the generous gift of $5,000 from the Ohio High School Football Coaches Association At The Ohio State University Woody Hayes Indoor Practice Facility. 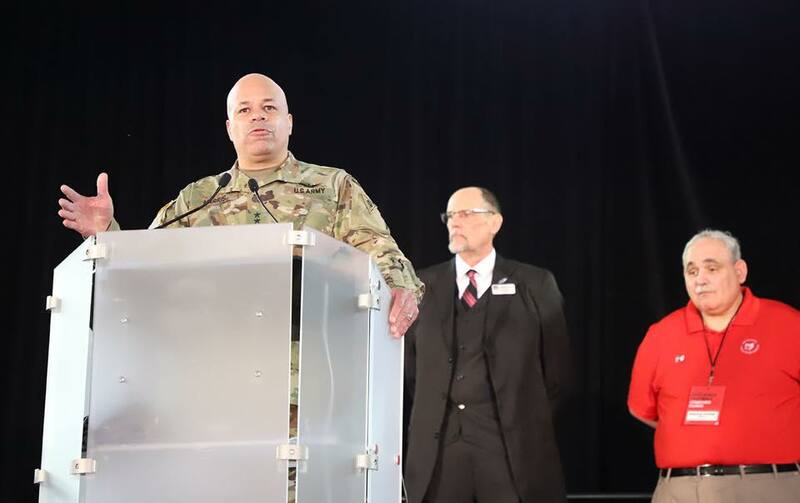 Mr. Gerald Cooke (L) and Major General Harris (R) Adjutant and Commanding General of the Ohio National Guard Made The Presentation At The Annual Coaches Meeting. 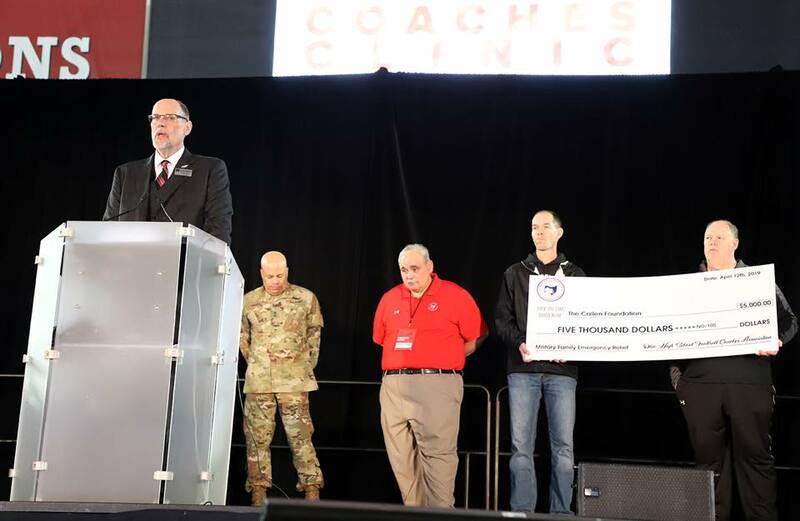 100% Of The Association's Donation Will Be Used To Fund Emergnecy Financial Needs Of Ohio Military Families Throughout The State Of Ohio Using The Ohio National Guard's Familiy Assistance Centers. 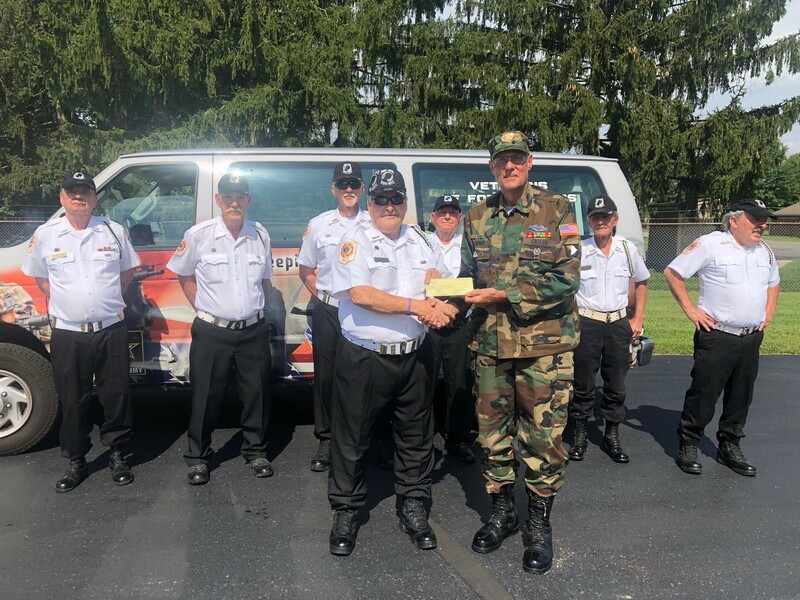 The Callen Foundation Would Like To Thank The WESTERVILLE COMMUNITY UNITED CHURCH OF CHRIST, For It's Generous Donation Of $1,100 To Help Support The Emergency Fianancial Needs Of Ohio Military Families. A Big Thank You To Sue Miller And Her Church Group That Raised These Funds Throughout The Year And Elected To Donate To The Callen Foundation. 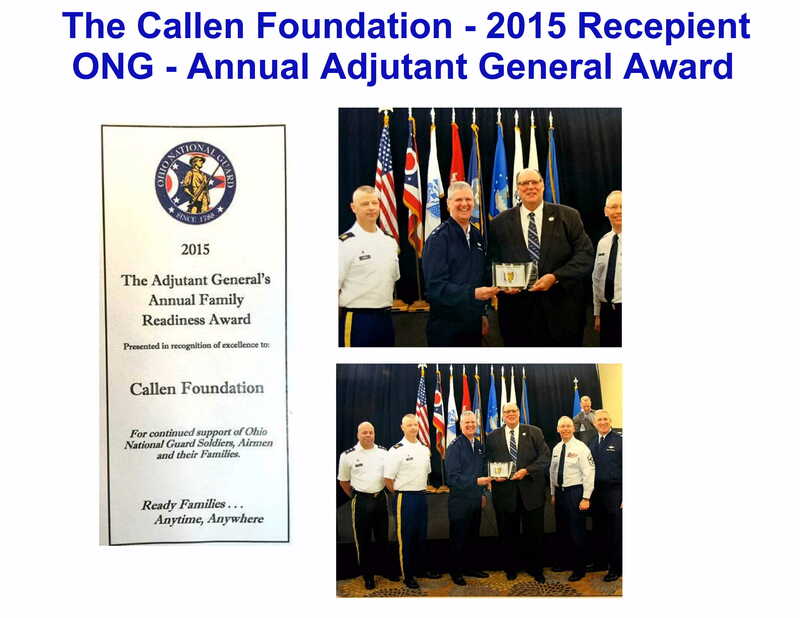 The Callen Foundation,Founder, Chris D. Callen, accepts the 2017 Ohio National Guard's Adjutant General's annaul award their annual awards banquet held at The Ohio State University.The Foundation thanks the Ohio National Guard for selecting The Callen Foundation for this prestigious annual award. 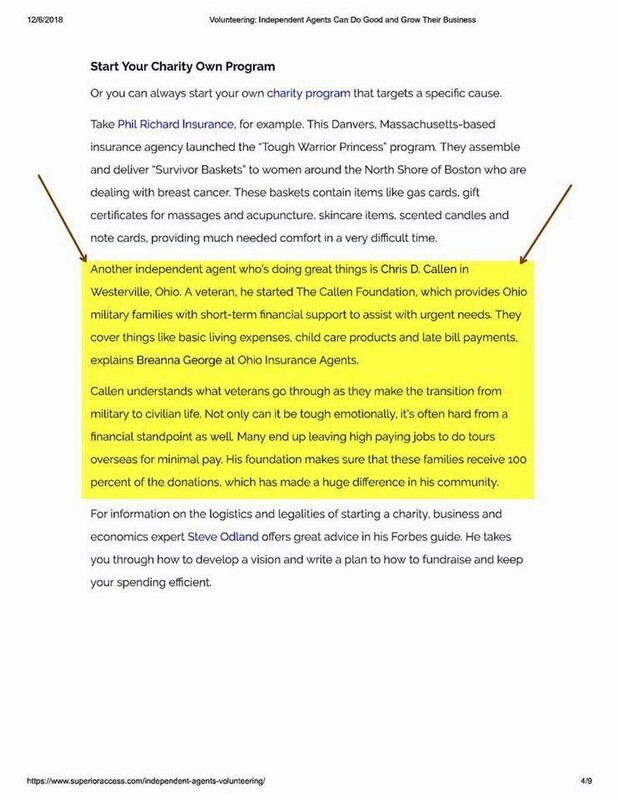 The Callen Foundation provides a unique funding source for immedate emergency funding for thier Ohio troops. 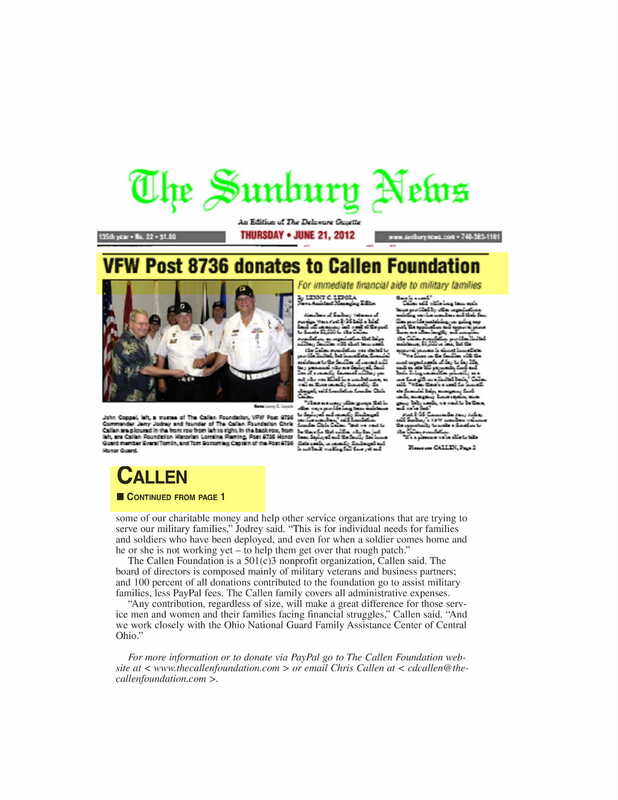 The Callen Foundation Sends A Special Thank You To The VFW Post 8736, In Sunbury Ohio, For Theie Geneous Gift Of $10,000 To Help Support Ohio Active Duty Military Familes. What A Tremendous Gester. 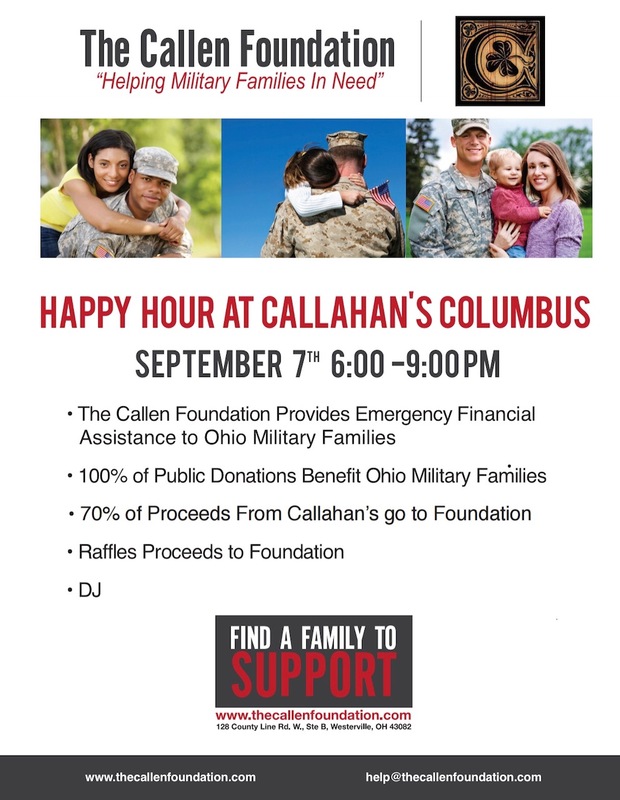 The Callen Foundaton Thanks Callahan's Bar, 520 Park St. Columbus, Ohio For Their Sponsorship Of A Fundraising Friday Happy Hour To Raise Funds For Ohio Military Familes. 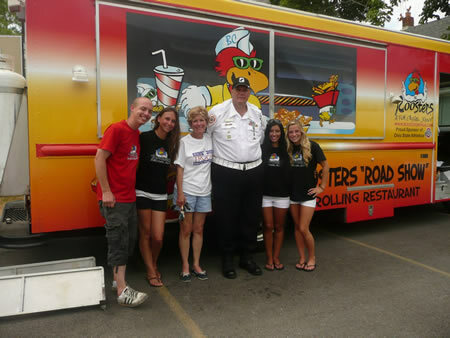 70% Of All Proceeds For The Nights Events Were Donated To The Foundation. 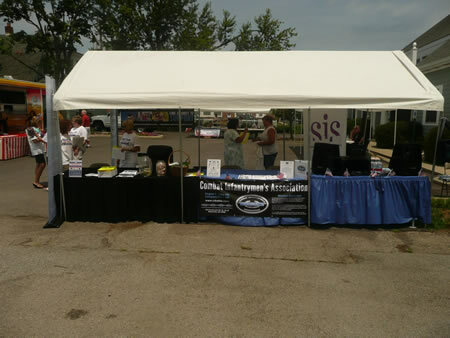 Also A BIG THANK YOU To Our Volunteers, Sue Cass, Kim Hickman And Michelle Chippas ! 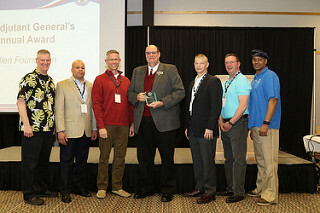 The Callen Foundation, and Founder, Chris D. Callen, accepts the 2016 Ohio National Guard's Adjutant General's annaul award from Major General Bartman, and other commanding Generals and Command Sergeant Majors, of The Ohio National Guard at their annual awards banquet held at The Ohio State University.The Foundation thanks the Ohio National Guard for selecting The Callen Foundation for this prestigious annual award. 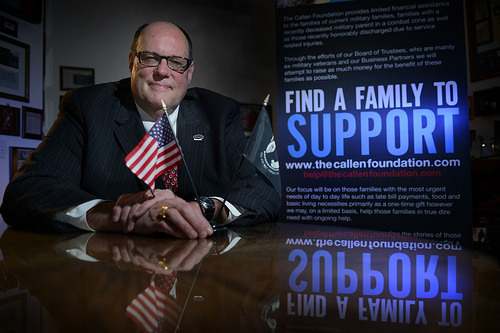 The Callen Foundation provides a unique funding source for immedate emergency funding for thier Ohio troops. 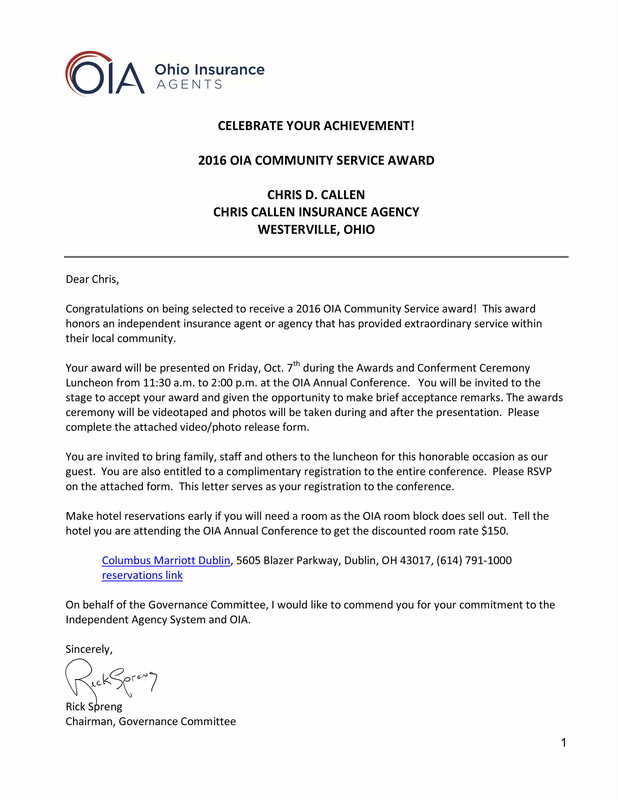 The Callen Foundation - 2016 Selected For The Ohio Insurance Agents Assocation - Community Service Award. 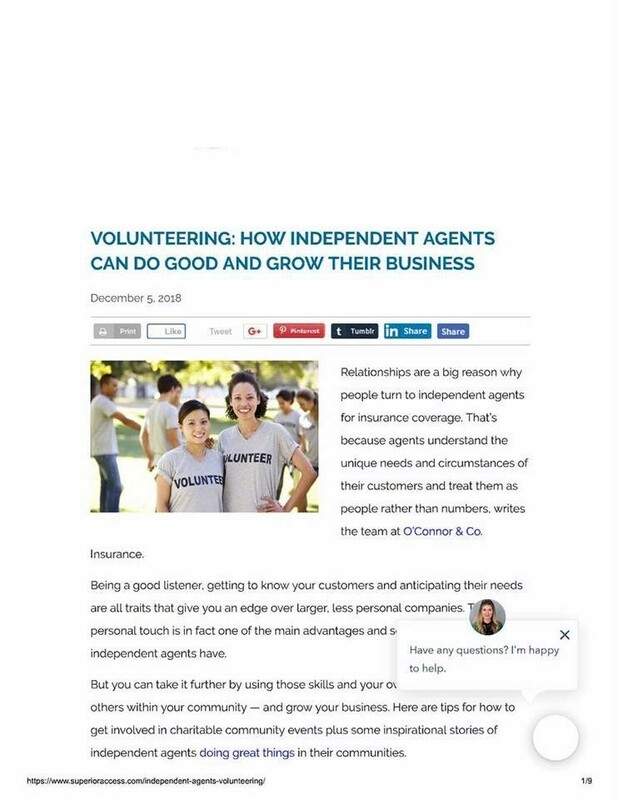 This Association Is The Ohio Chapter Of The National Indpendent Insurance Agents Association. 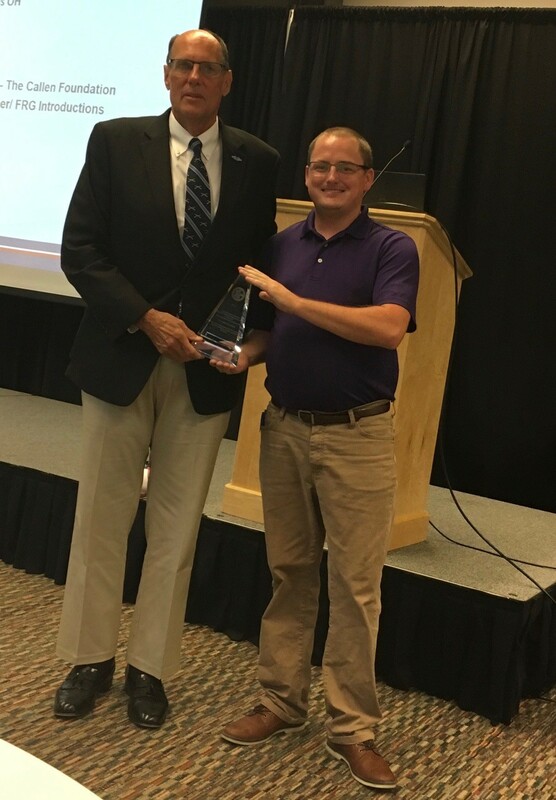 Captain Douglas Franz, The Ohio National Guard Family Assistance Director, (Pictured Below With Chris Callen) Was Invited To Introduce Chris Callen & The Callen Foundation To The Audience. 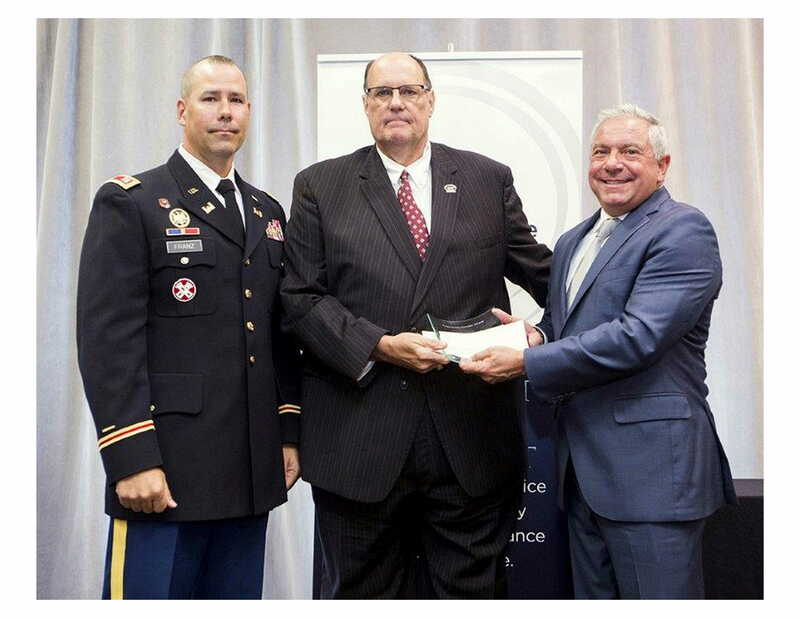 Major General Bartman - Adjutant General Of The Entire Ohio National Guard, With Major General Harris, Commander Of The Army Ohio National Guard presented Lynn and I, on behalf of The Callen Foundation, their annual Adjutant General award at the Embassy Suites in Dublin. Lynn and I would like to thank all of you that have made donations or have helped support the Foundation in the past. 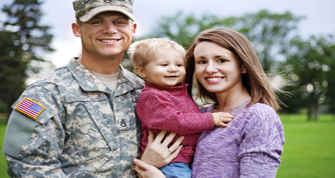 Without your support we could not be helping as many military families that we do. Please remember us for as a recipient for your next organizations charity fundraising event. 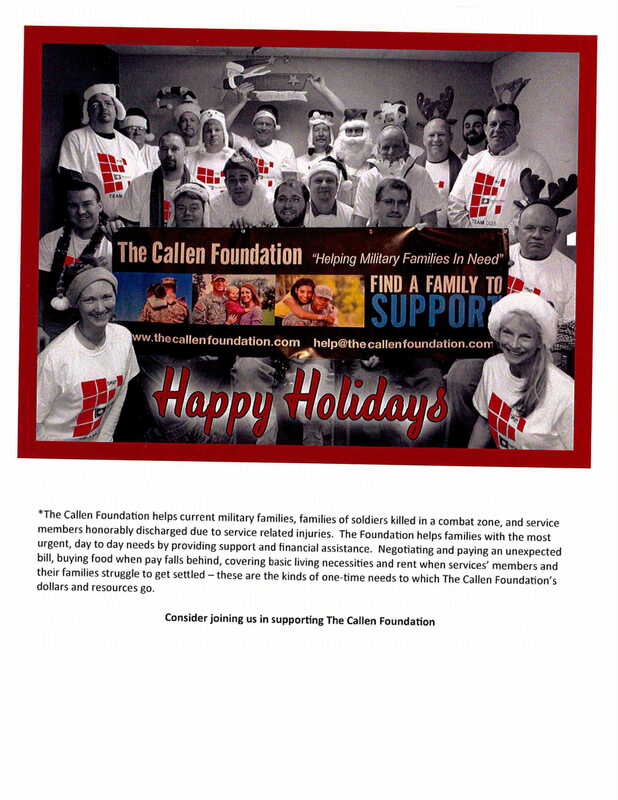 Team DDS Sponsors The Callen Foundation For Christmas ! 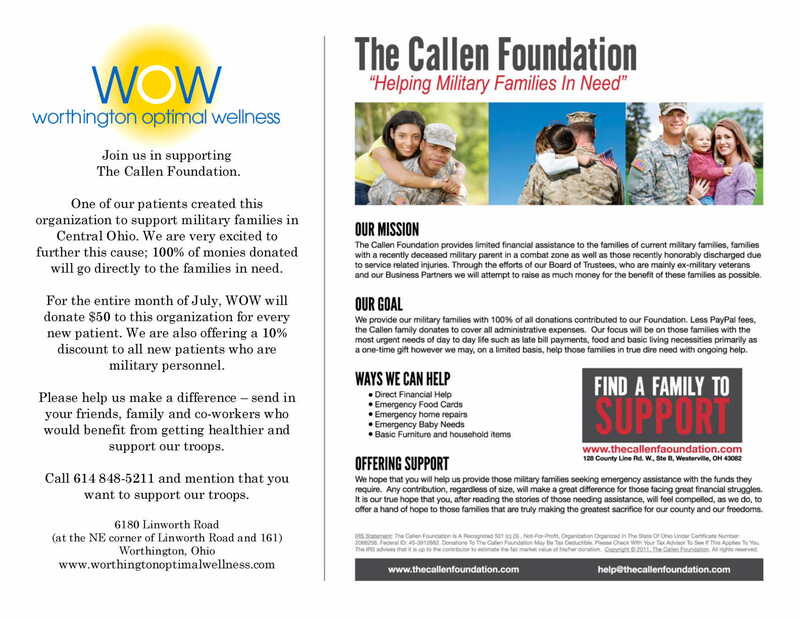 The Callen Foundation was asked by the General Manager of the Columbus Clippers, Mr. Ken Schnacke, to promote the first Military Baseball Card Night at clippers stadium on the 4th Of July. 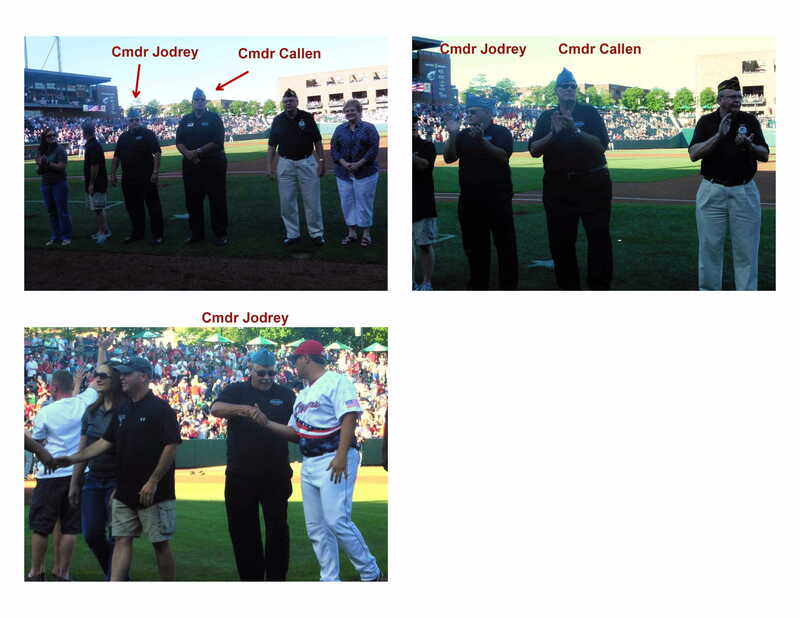 Our nominiation of our Board member, Jerry Jodrey, as a card selection member was accespted and Jerry was prominently featured both on the field and with his picture on the scoreboard. 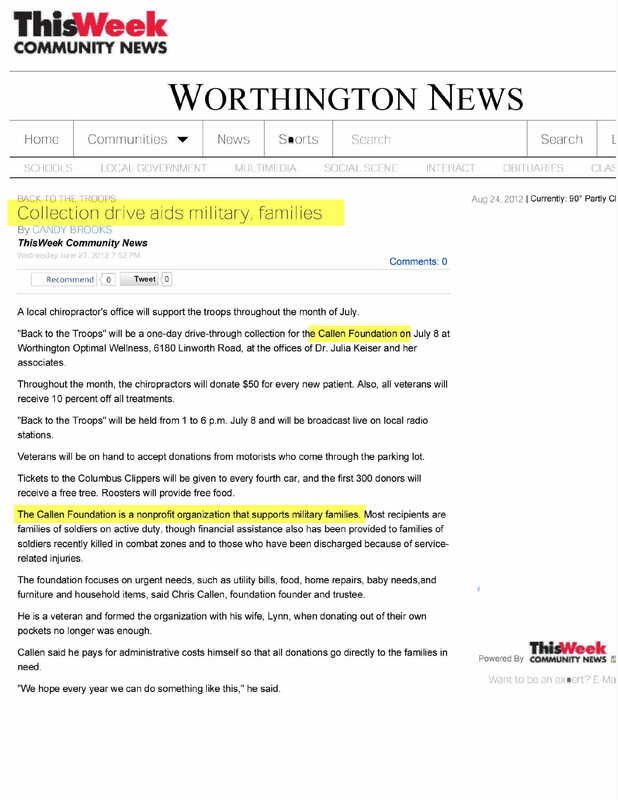 The Callen Foundation was featured in a WCMH Channel 4 TV News Spot On The Evening News For 3 Days This Week. 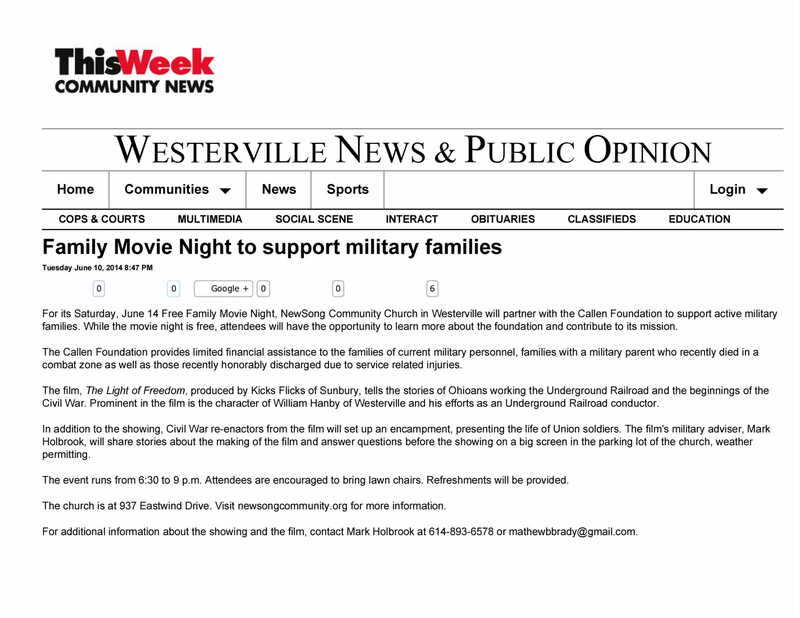 We Wish To Thank News Reporter Mindy Drayer For Her Tremendous Support Of Ohio Military Families & Veterans By Giving Us The Opportunity To Expose Our Foundation & What We Do For Ohio Military Familes. 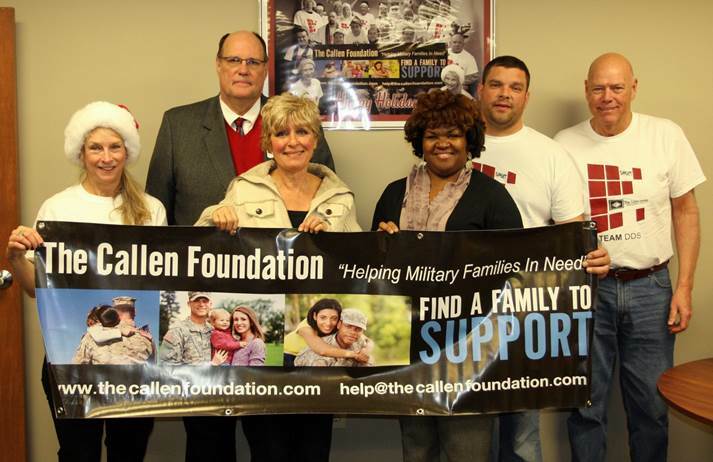 The Callen Foundation was named this year's recepient of the NewSong Church Family Movie Drive In Night - Nightly Proceeds. 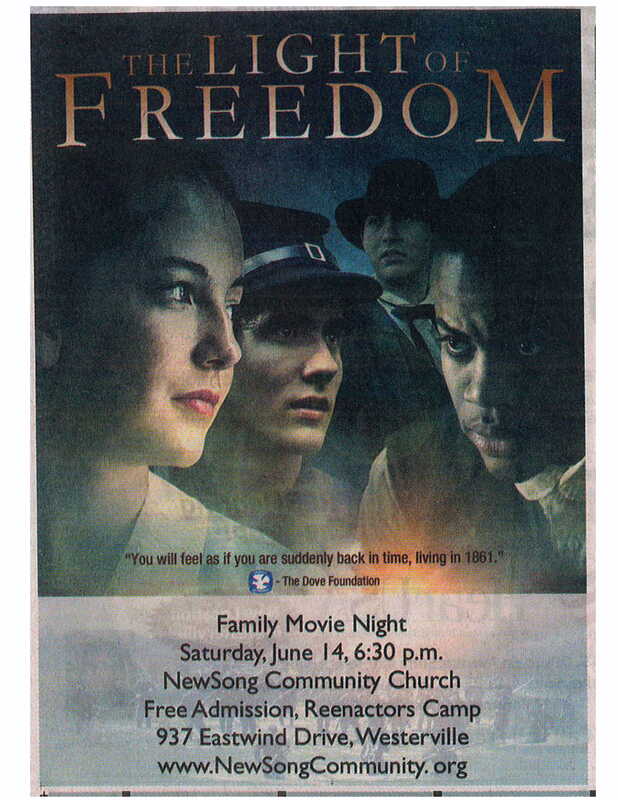 The movie - The LIght Of Freedom - was produced by a Central Ohio director and documents the Ohio link to the Underground Railroad during the Civl War. 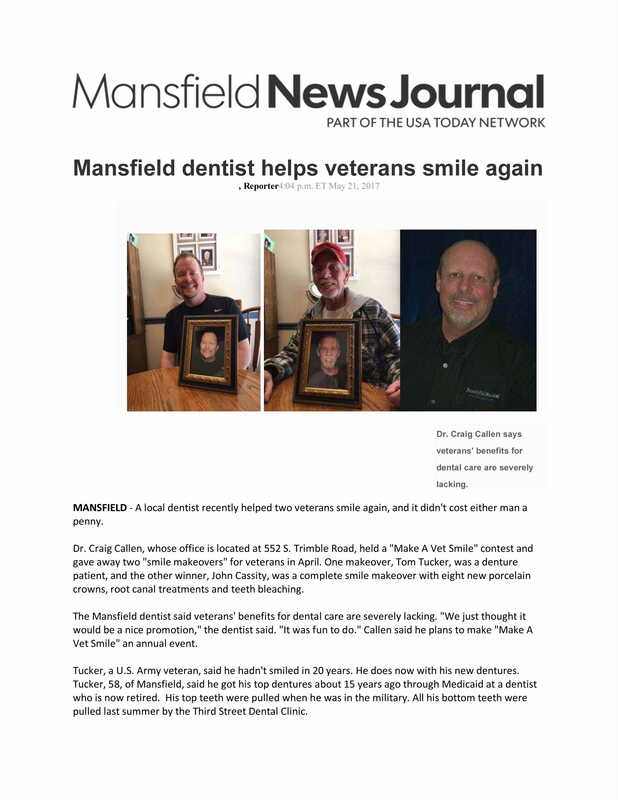 We thank Pastor Rick Vilardo and Marketing Director Mark Hamoon, for all of their support and help with making this a great event to raise funds for our Ohio military families ! 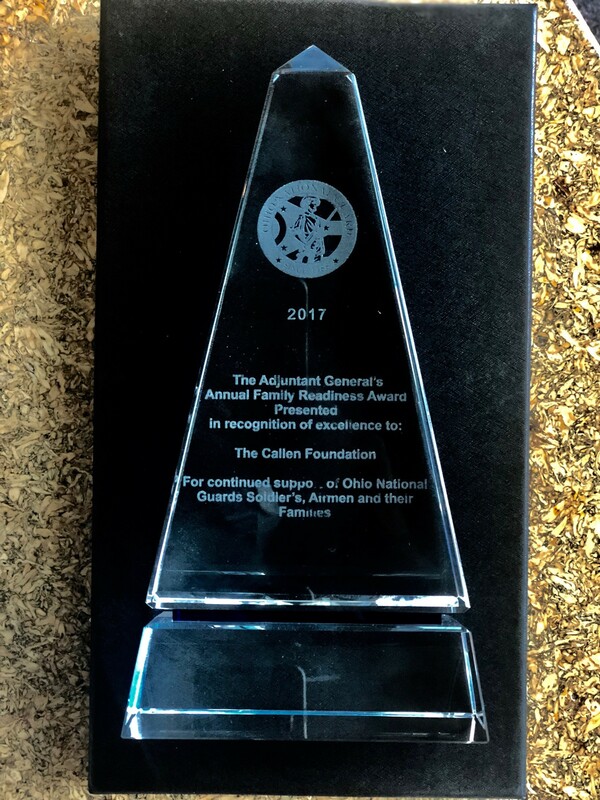 The Callen Foundation - Nominiated In The Top 20 For The Recepient Of The Nationwide Insurance & Columbus Dispatch & WBNS Channel 10TV 2014 Jefferson Award. A Luncheon Will Be Held At The Wolfe Family's Exclusive Retreat, The Wig Wam, Where This Years Recpeinet Will Be Named. 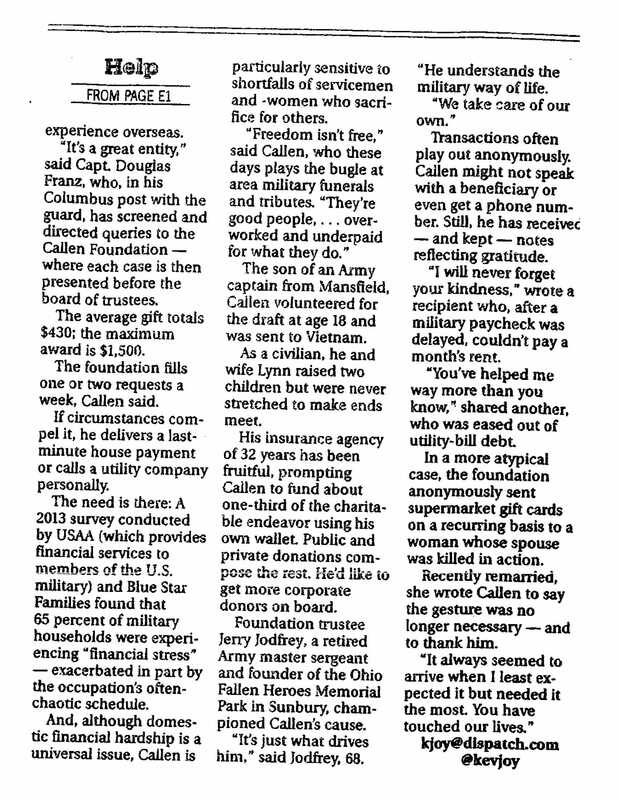 2013 - The Callen Foundation - Recepient Of The Ohio AMVETS Ladies Auxillary Statewide Fundraising Event - A BIG Thank You To The Ladies Who Donated Significant Funds to Help Ohio Military Families In Need. 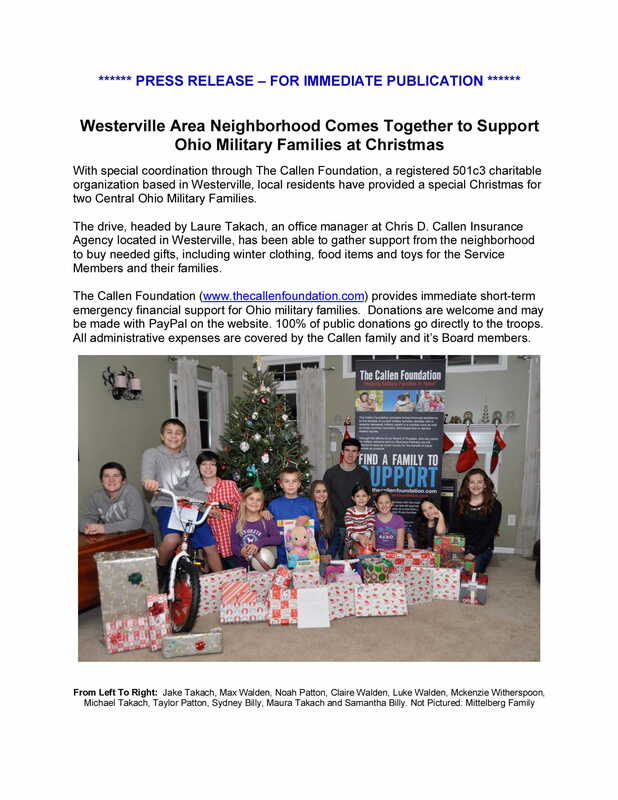 A Big Thank You To All Of Those That Made Christmas Extra Special This Year For Two Ohio Military Families ! 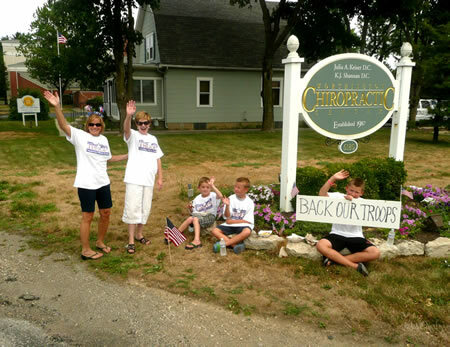 Dr. Julia Keiser & Worthington Optimal Wellness Donates $50 Per New Patient For Month Of July ! 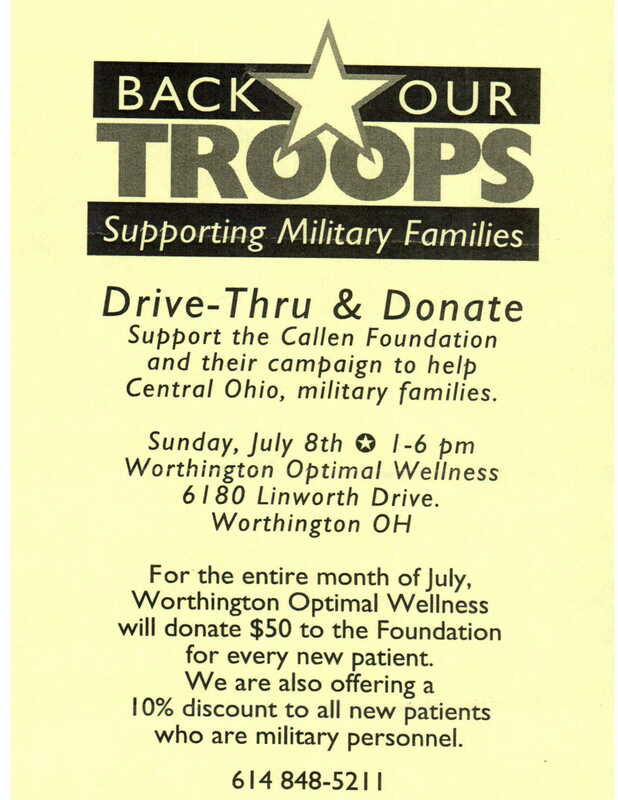 1st Annual Back Our Troops Campaign - Our first Central Ohio major event will be happening Sunday, July 8th from 1:00 PM to 6:00 PM in the parking lot of Worthington Optimal Wellness, 6180 Linworth Road in Worthington, Ohio. 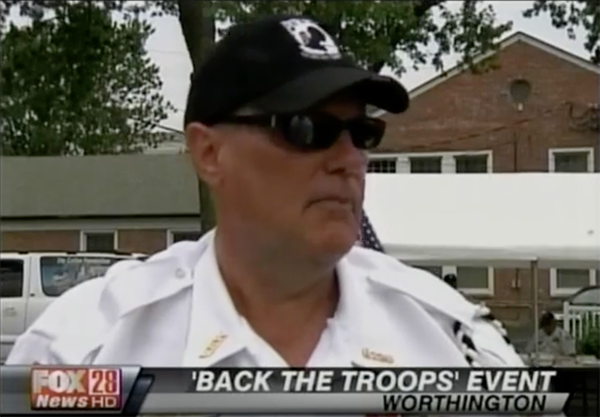 It is called our Back Our Troops Campaign. 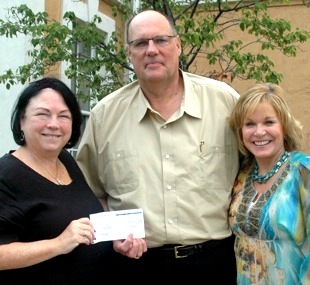 Dr. Keiser will graciously donate $50.00 to the Foundation for every new patient seen in the month of July. 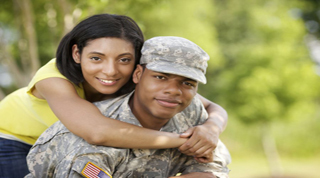 Also she will provide a 10% discount for the month to any person with a military identification card. 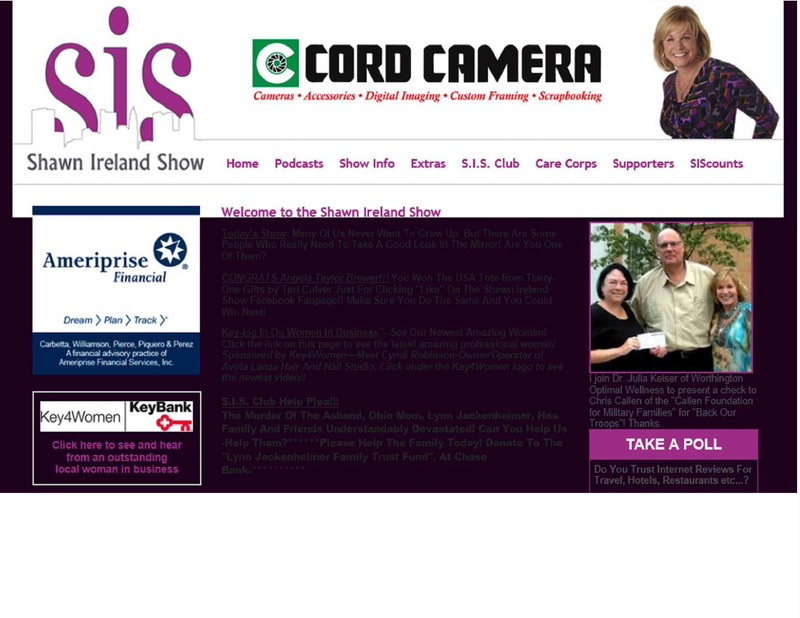 Shawn Ireland of the The Shawn Ireland Show On Radio 610 / WTVN, has worked very hard to help us make this event special. 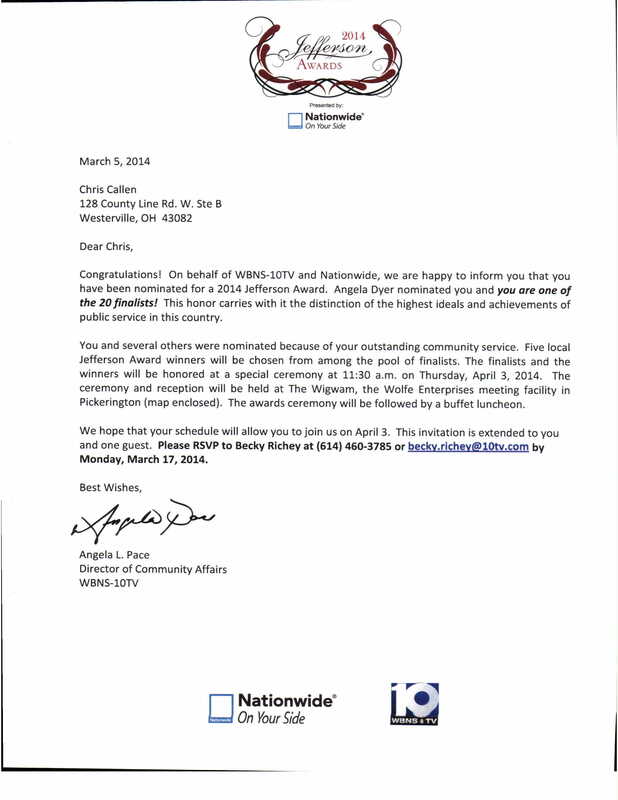 Shawn has arranged for our TV personalities from Good Day Columbus on Fox 28 to cover our event. 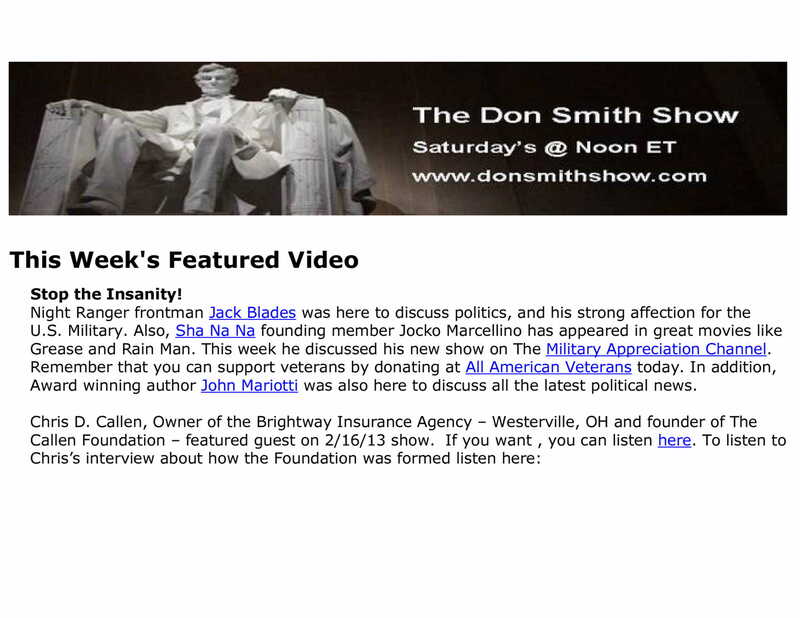 Shawn will be broadcasting call in reports throughout the day.on Radio 610 / WTVN. 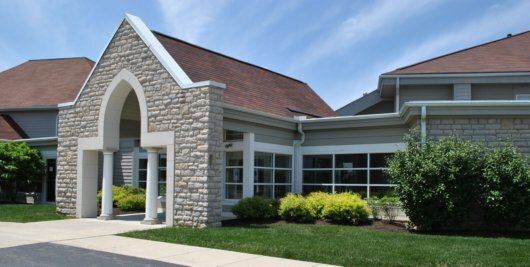 On Sunday, July 8th between 1:00 PM & 6:00 PM we will have a drive-through donation collection center set up, manned by both current and ex-military people to accept drive by donations. A VFW Honor Guard opening ceremony will include Posting Of The ColorsCeremony will kick our our event. 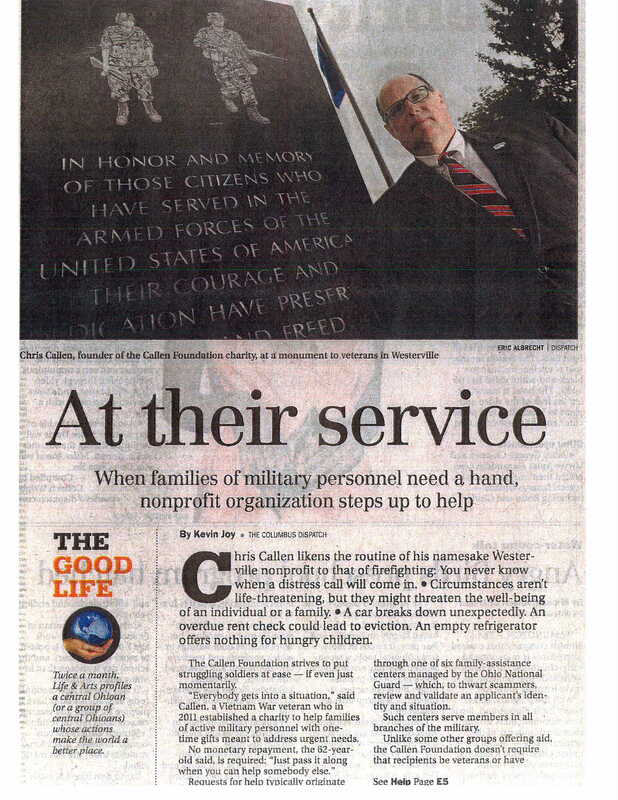 Ohio National Guard Family Assistance Planning Center to be sure all funds are spent wisely and for real needs. 2) A Free Pine Tree Starter Tree with planting instructions will be given to the first 500 who donates that day (limit 1 per car), You will be able to go home and plant your tree in remembrance of a soldier or family member so that years from now you will remember the day you helped out a struggling military family. 4) Huntington Park - Home Of The Clippers, will provide a limited amount of Free Baseball Game Tickets to see the Clippers. 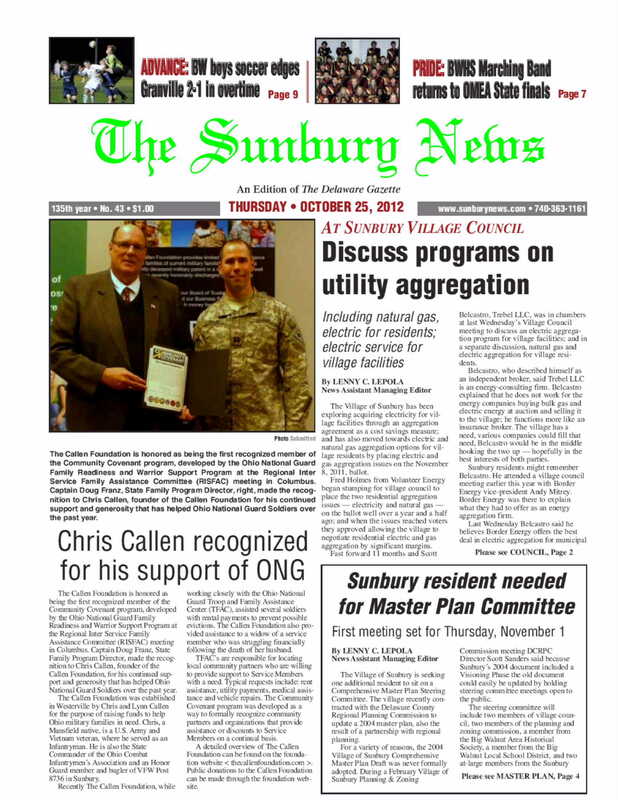 6) VFW Post 8736- Sunbury will provide a manned Flag Retirement Collection Station for anyone having an old American Or Ohio flag, that they haven't been able to dispose of because they cant throw them away or burn them, will be able to drop off for proper disposal by the Honor Guard at their annual Flag Retirement Ceremony held each October. 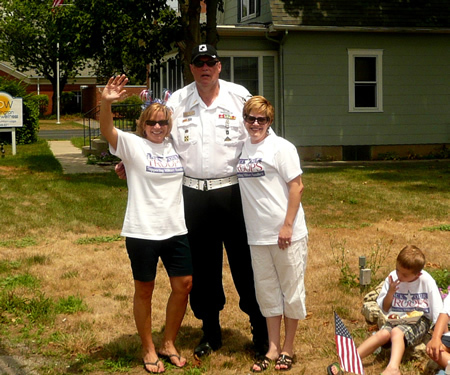 7) Sunbury VFW Post 8637 Woman's Auxiliary - will host a Bake Sale of home made baked goods throughout the day. Come quick because these delicious treats usually sell out fast ! 8) For more information on our event please visit Shawn Ireland's Website where she will be keeping updated postings of all the surroundings of our event. Visit her site at:. : www.ShawnIrelandShow.com. Individuals That May Be Interested In Helping The Foundation Succeed. 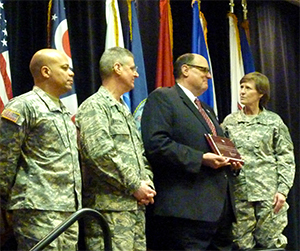 Major General Bartman - Adjutant General Of The Entire Ohio National Guard, With Major General Harris, Commander Of The Army Ohio National Guard presented Lynn and I, on behalf of The Callen Foundation, their annual Adjutant General award at the Embassy Suites in Dublin. Lynn and I would like to thank all of you that have made donations or have helped support the Foundation in the past. 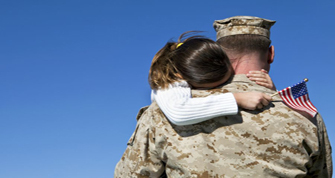 Without your support, we could not be helping as many military families that we do. 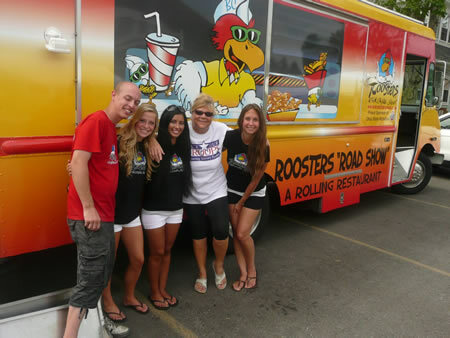 Please remember us for as a recipient for your next organization's charity fundraising event. 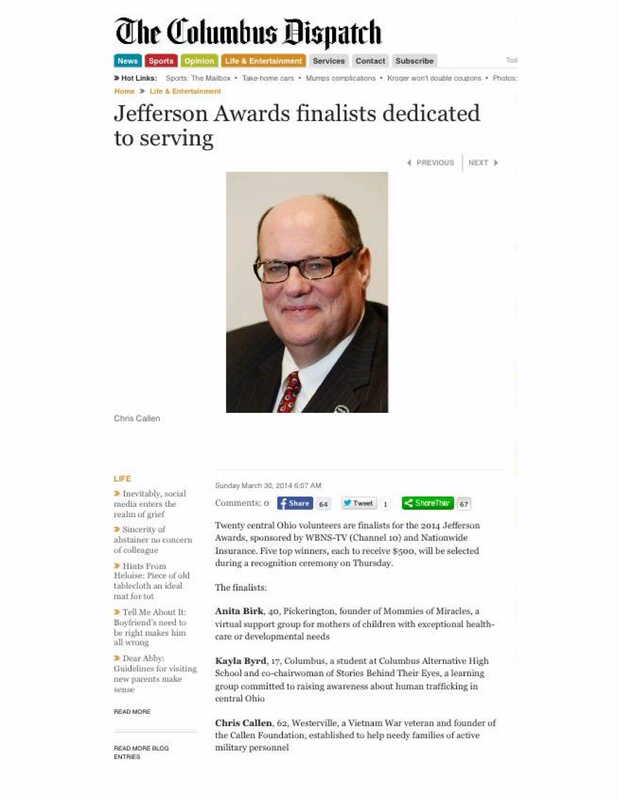 Quite an honor. Who would ever thought a US Army Specialist 4 would be on the same platform with three generals (including two, two star Major Generals). This award also belongs to our Board without them we would not have gotten this far. 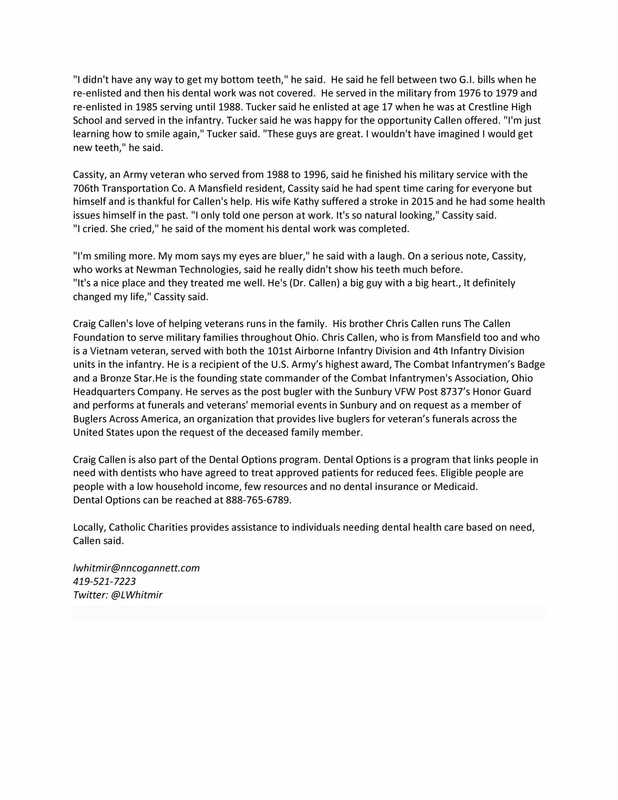 The Callen Foundation was featured in a WCMH Channel 4 TV News Spot On The Evening News For 3 Days This Week. 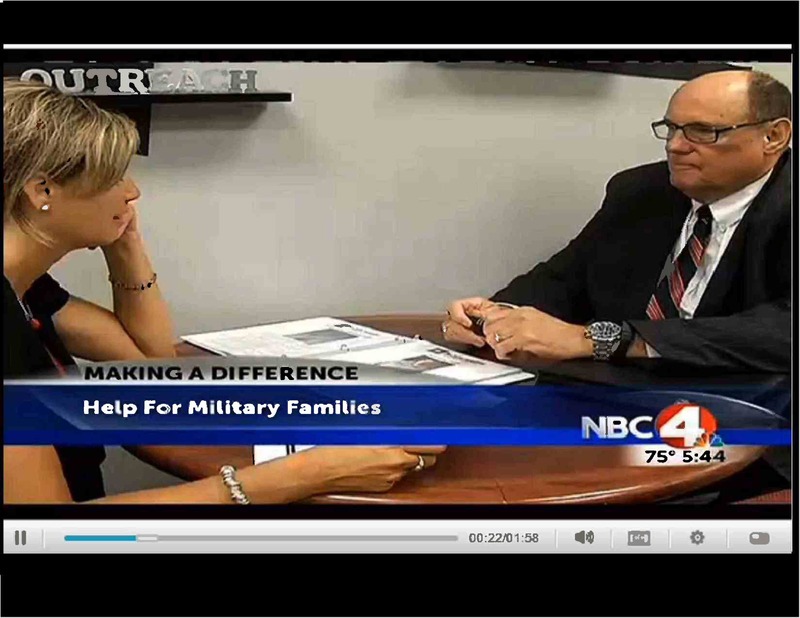 We Wish To Thank News Reporter Mindy Drayer For Her Tremendous Support Of Ohio Military Families & Veterans By Giving Us The Opportunity To Expose Our Foundation & What We Do For Ohio Military Families. Interview With Chris Callen & FOX TV News.